Although usually associated with bloodwine, Star Trek’s Klingons are also fond of their warnog—a clear, Klingon ale that’s just not as good out of the replicator. Now, thanks to CBS Consumer Products, Trekkies will be able to taste that Klingon specialty for themselves. 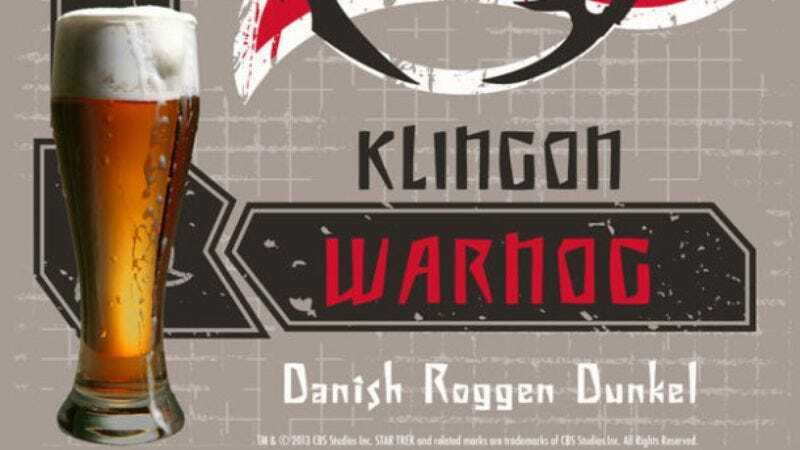 CBS and Federation of Beer have teamed up on an official Star Trek-themed Dunkelweizen called Klingon Warnog, a beverage billed as “a bold beer suited for the harsh Klingon lifestyle” (and hopefully the intense Klingon partying lifestyle as well). Warnog's aroma is predominantly mild banana and clove produced by the German wheat yeast, supported by subtle sweet malt character from the use of Munich malt. The flavor draws heavily from the blending of the rye malt and traditional clove character, creating a very rich and unique flavor. The inclusion of wheat and caramel malts help to round out the mouthfeel of this beer, making this Dunkelweizen hearty enough to be called a Klingon Warnog.